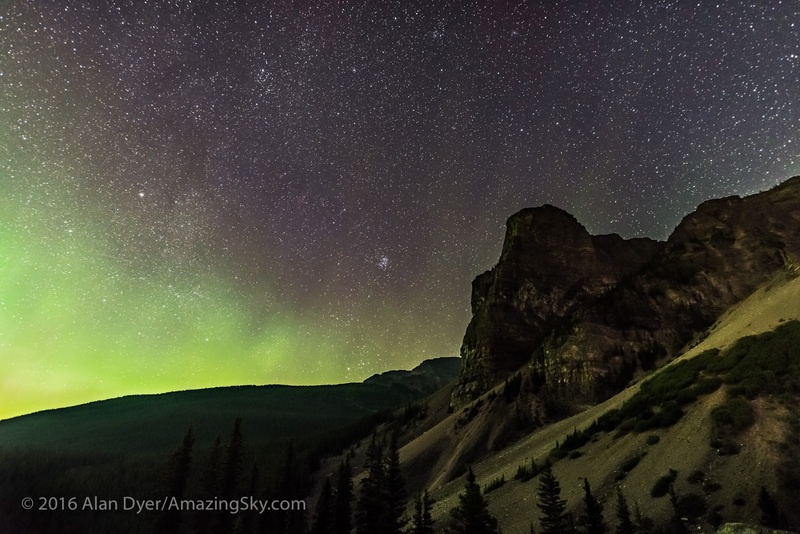 My new 4-minute video presents time-lapse and still images shot in the Rockies this past summer. It’s been a busy summer for shooting. 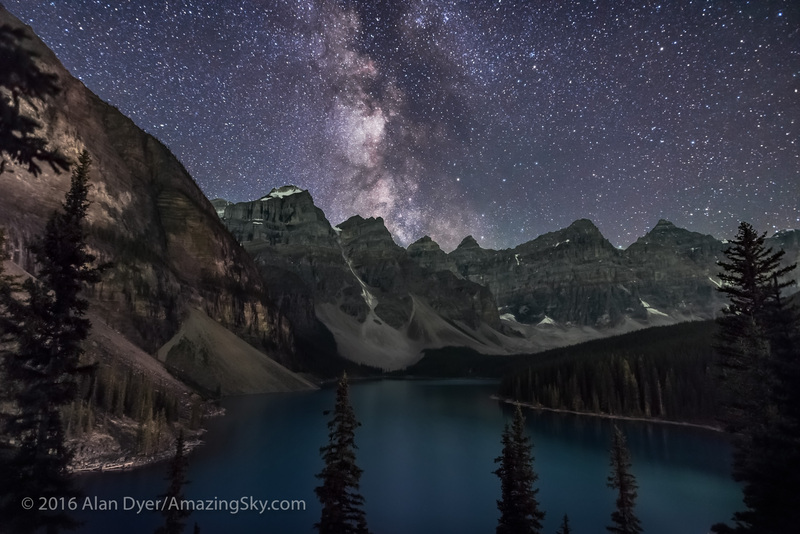 Since July I’ve spent a week each in Banff, Jasper and Waterton Lakes National Parks shooting nightscape stills and time-lapse videos of Alberta’s famous Rocky Mountain landscapes by night. This compilation includes some of the best footage, plus some panned still images, set to a wonderful piece of royalty-free (i.e. legal!) music by Adi Goldstein. For many of the sequences I employed “motion control” (MoCo) devices that incrementally move the cameras during the one to three hours that they are taking the 200 to 450 frames needed for a time-lapse sequence. I used the compact single-axis Radian, the 2-axis eMotimo, and the Dynamic Perception Stage Zero dolly, now equipped with their new Stage R single-axis panning unit. This was the first summer with the eMotimo and Stage R, so I’m still learning their best settings for speed, angles, and ramping rates. In recent blogs you’ve seen many still images shot as part of these sequences, or with other cameras dedicated to shooting stills. Now you get to see some of the time-lapse videos that represent many nights of shooting, and many hours sitting in the car waiting for the automated camera gear to finish its shooting task. 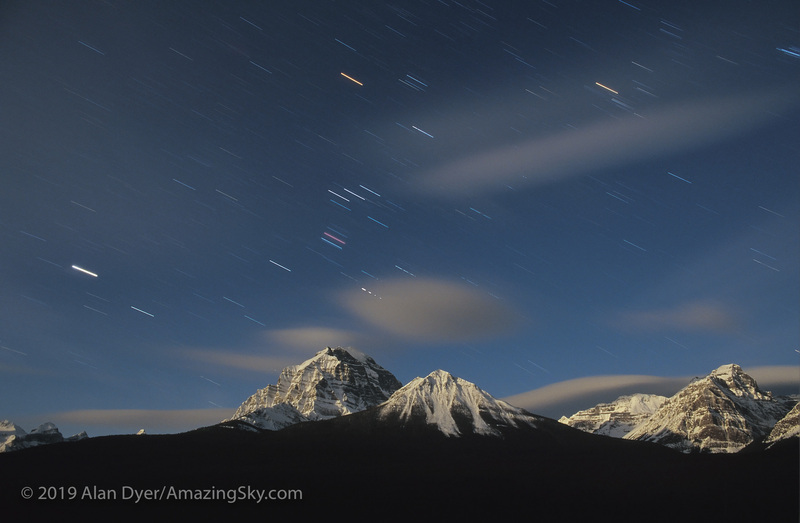 Time-lapse shooting is an exercise in dedication and self-denial! I hope you enjoy the result. Do click on the Enlarge button to go full-screen. Or visit my Vimeo site to watch the video, and others, there. 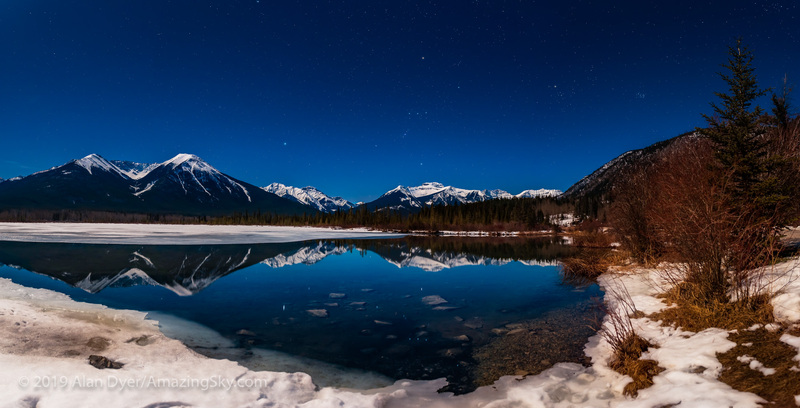 Peaks of the Continental Divide reflect in the calm waters of Lower Waterfowl Lake. 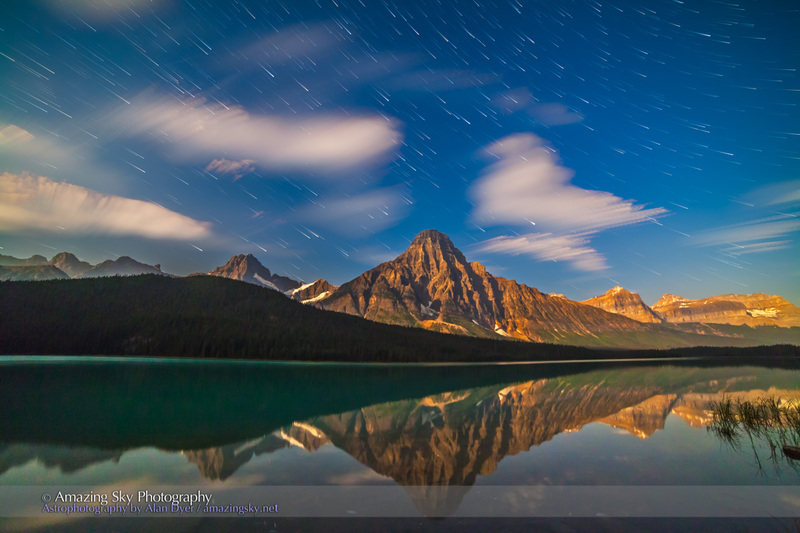 These images provide a sense of what a beautiful night this was, last Monday on the Icefields Parkway in Banff. 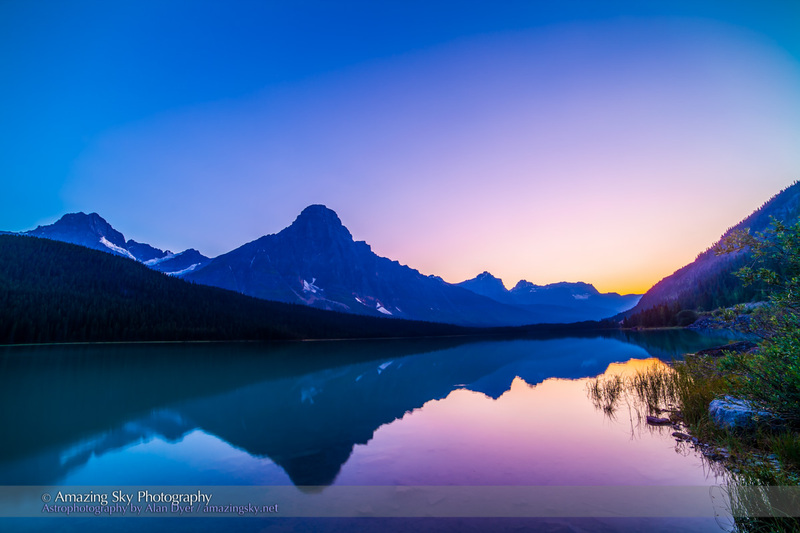 The evening started with a super-clear twilight providing subtle shadings – from the last glow of sunset on the horizon, through the “twilight purple” above, to the deep blue of the darkening sky at top. The purple hue comes from red sunlight still illuminating the upper atmosphere and blending with the blue sky from the usual scattering of short blue wavelengths. The twilight scene is a high-dynamic range blend of several exposures processed with Photoshop’s HDR Pro as a 32-bit file in Adobe Camera Raw. Taking different frames from the same set that I used to capture the Space Station I created this star trail scene, of the western stars setting over Mt. Cephren. 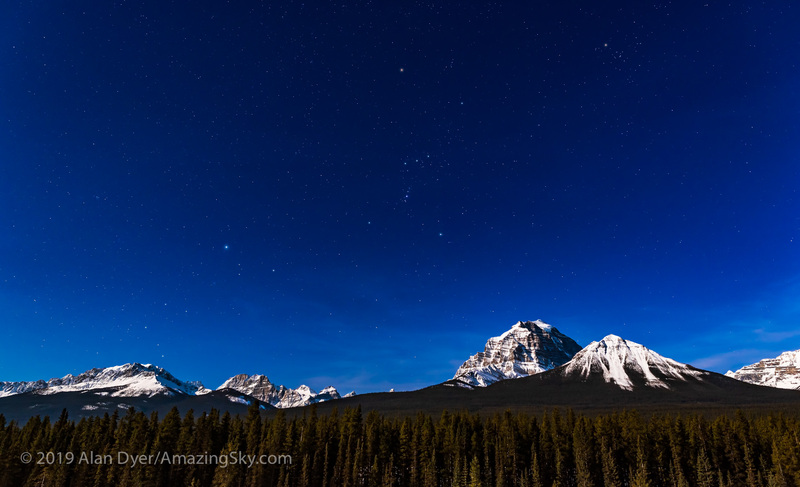 Light from the one-day-past Full Moon illuminated the peaks that line the Continental Divide. 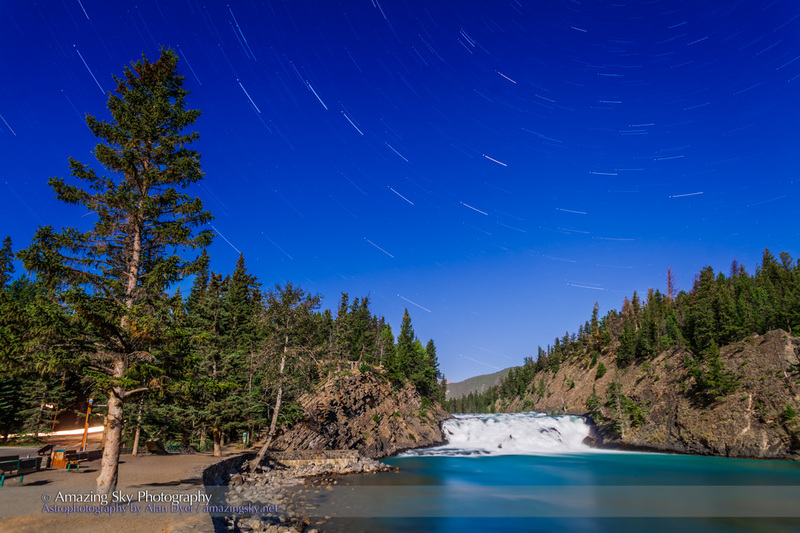 The star trail scene is a composite – of many images stacked to create the star trails, blended with a masked single image from the set to supply the landscape. 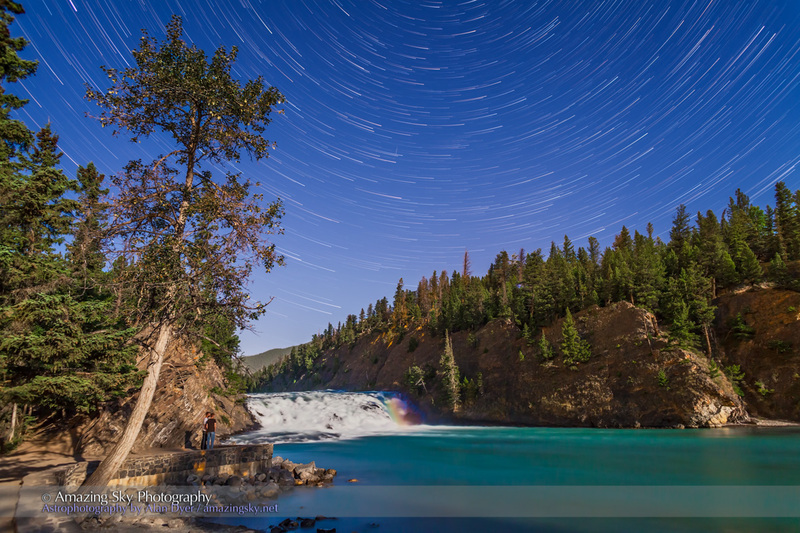 For the star trail stacking I used the excellent Advanced Stacker Plus actions from Star Circle Academy. To separate and mask out the sky from the landscape image I used Photoshop’s Quick Selection tool and its wonderful Refine Mask function. The setting sun lights the clouds over the river plains of the North Saskatchewan. 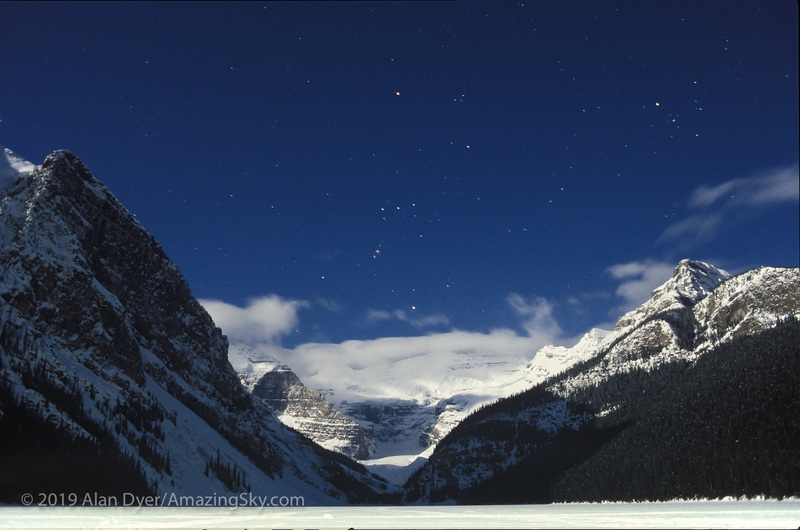 This was the panoramic view two evenings ago from the Howse Pass viewpoint on the Icefields Parkway in Banff. We’re looking south over the North Saskatchewan River near its junction with the Howse and Mistaya Rivers. The spot is near where Highway 11, the David Thompson Highway, comes in from the east to join the Parkway. It’s a modern highway now but 200 years ago this was a main canoe route for the fur trade. 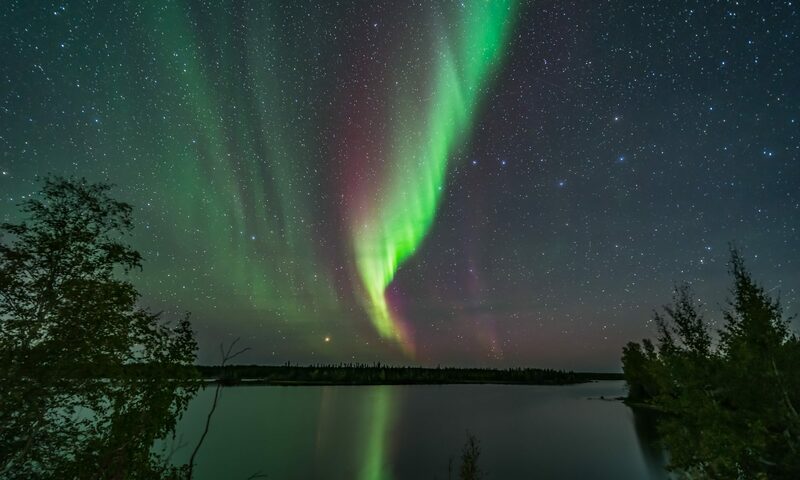 The area is known as David Thompson Country, named for the great explorer, surveyor, and celestial navigator who mapped much of western Canada in the early 1800s. Until about 1810, Thompson passed this way every year en route to the fur trade forts he set up in the B.C. interior, his main job for the North West Company. Conflicts with the local Pikanii people, who objected to Thompson trading with and arming their traditional enemies, the Kootenais, forced Thompson to find a new route across the Rockies, the Athabasca Pass in what is now Jasper National Park. 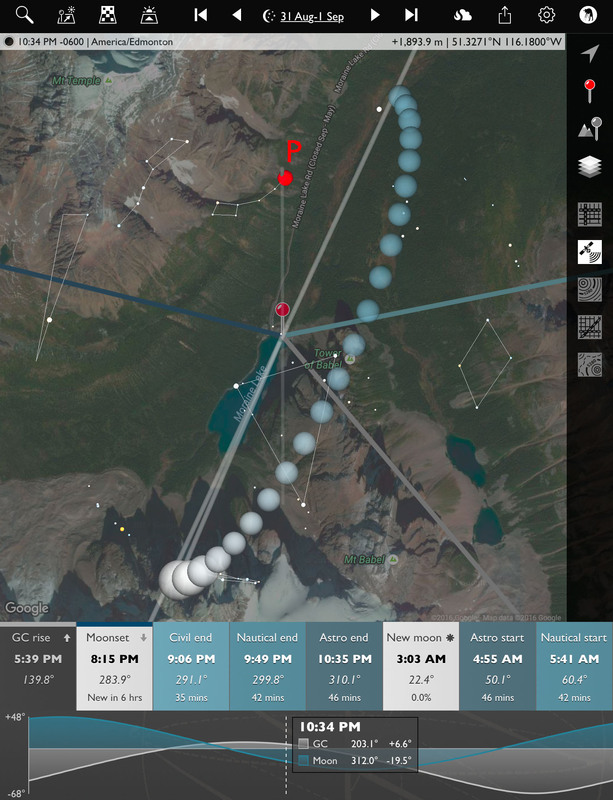 The top image is a 180° panorama, the bottom image is a full 360° panorama from the viewpoint. In the distance are Mt. Murchison, at left, and Mt. Cephren in the far distance, the prominent peak by Waterfowl Lakes. I shot these with a 14mm lens, in portrait orientation, and stitched them with PTGui software. The top image is made from 6 segments, the bottom from 12 segments. The software blended them perfectly, no small feat in such a uniform twilight sky. I’m always impressed with it!